Three states, two time zones, and close to 600 miles. We woke up in Ohio this morning, spend the afternoon in Indiana, and are now safely tucked into bed in Illinois. 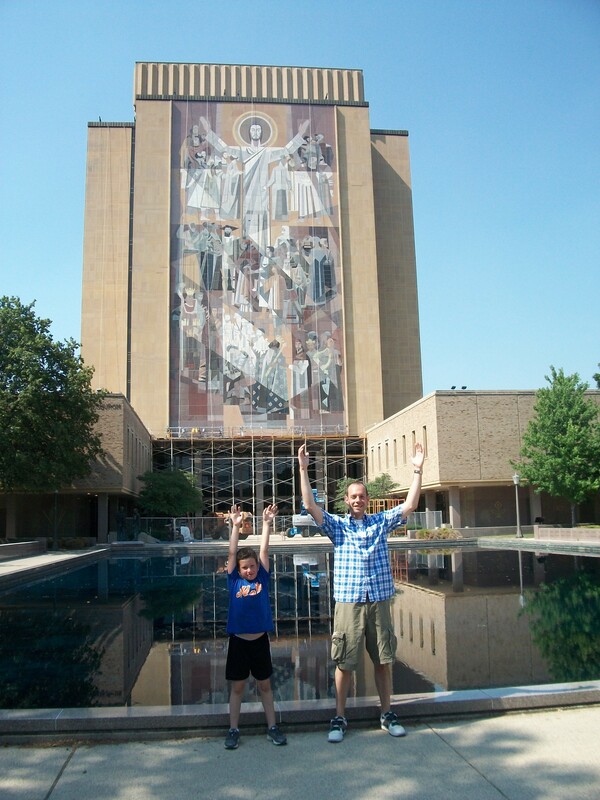 In between, we saw Touchdown Jesus, bookended by a few smiles. Allow me to explain. Our main stop today was the University of Notre Dame in South Bend, Indiana. Well, techinically, the campus is its own town (Notre Dame, IN) with its own post office and everything, despite being fully engulfed in South Bend. It’s like the Vatican of Indiana. In more ways than one. But on the way there we made a quick stop in Ashley, IN (population approx. 1,000) to see the water tower pictured above. And duty points the way. I doubt I’ll ever move to Indiana, but if I do, Ashley might be a good starting point. Anyway, next up was South Bend, home to the College Football Hall of Fame (we skipped it–we’re a little Hall-of-Famed out right now), the Studebaker Museum (we skipped that, too), and Notre Dame, which we almost missed. I was rushing to make it in time for the last campus tour of the day, which is at 3pm. What I didn’t realize was that they only have tours on weekdays. Lucky for us, the people who work in the school’s visitors center are from Indiana and not New York, so they happily accommodated us by quickly rustling up a student tour guide just for the two of us. Holy [insert blasphemous name here], that place is freakin’ Catholic! I mean, I knew it was a Catholic university, but wow! Cathedrals EVERYWHERE. Even the dorms look like cathedrals. 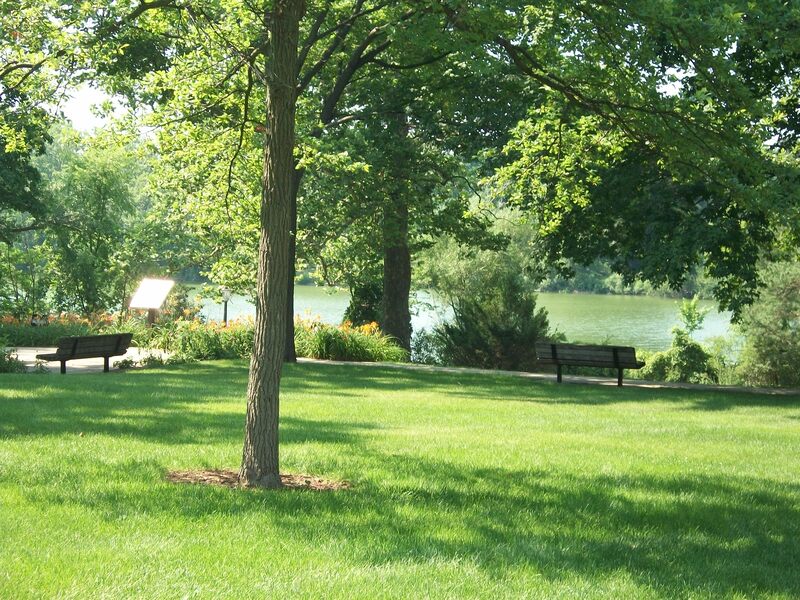 Still, as a graduate of Queens College and of LIU Brooklyn, I was blown away by the beauty of the campus, which includes not just gorgeous architecture and perfect landscaping, but even two lakes where students can go swimming, kayaking, and even fishing. Actual Catholics get excited about the stunning basilica and its gold dome, but the highlights of the tour for both Sam and I were the grotto where Rudy prays to be admitted, the football stadium, and the hunormous stone mural of Jesus directly across from the stadium. In case ya didn’t know, the mural can be seen from inside the stadium, looming over the Notre Dame end zone, and has thus become known as Touchdown Jesus. Touchdown! Betcha never thought you’d see a giant picture of Jesus on this blog, especially the same day as a post about kosher food. From Notre Dame we headed to Chicago, with a brief stop near the Indiana-Illinois border for dinner (once again, grilled with love outside a rest stop). Bellies full, we made one more stop in the extremely bad neighborhood of Calumet City, Illinois, where we found what claims to be the first smiling water tower in the country. Like its cousin in Ashley, it, too, wears a bowtie but between its faded color and its blighted location behind the aging parking lot of a trashy mall it’s clear that the tower known locally as Mr. Smiley has seen better days. 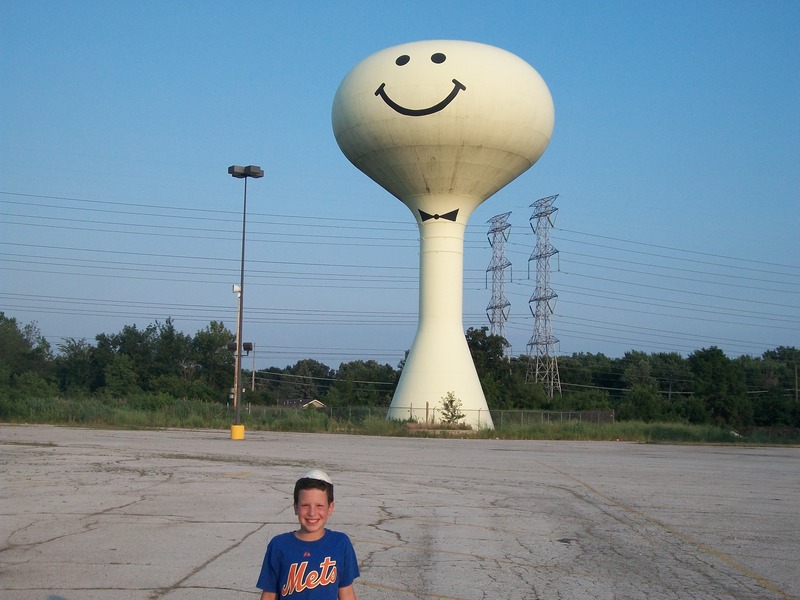 About a mile north of Mr. Smiley we ran into our third smiling water tower of the day. It looks exactly the same as Mr. Smiley but with no bowtie. It is reputed to be Mr. Smiley’s estranged wife and still goes by Mrs. Smiley. There’s nothing really feminine about her other than her refusal to wear a bowtie, which I have to assume is what led to their breakup. Done with the Smileys, we finally made it to Chicago (technically, the Hampton Inn Skokie) for laundry and sleep. Both are very much needed before a big day of sightseeing and baseball in that toddlin’ town tomorrow, plus the most exciting event of all: the arrival of Mommy! What I liked best about today, though, was the time we spent in the car. We compromised on music and Sam was even tolerant and tried to like most of what I put on. We spent hours talking about very little of real substance and just enjoying each others’ company. The Hamster never once dipped into his bag of car entertainment. More than once, he reached over and affectionately put his hand on my shoulder. With six total hours in the car, today could easily have been unpleasant or much worse. Instead, it was full of smiles. The arrival of Mommy also means the arrival of your mitt and Sam’s laptop, so no wonder it’s so exciting! Can’t wait to see my boys! I am really enjoying sharing this experience with you. 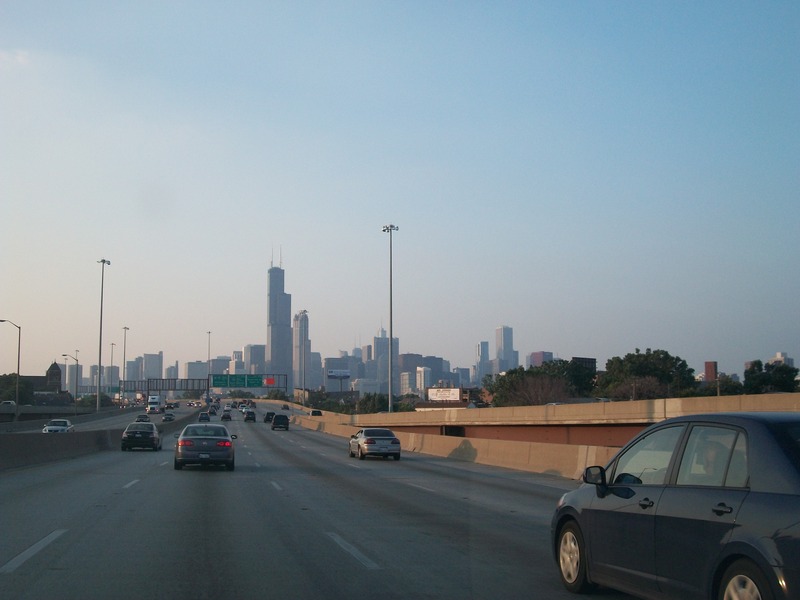 Its so cool that meeting up with Mommy, who knows all the good food in Chicago is part of the plan! Keep enjoying every minute! I cannot tell you how much I am enjoying your stories and I am quite jealous that you went to Cooperstown. I look forward to reading more; you are a great writer.